Windows Vista was known for its bugs and security glitches. Consequently, Microsoft spent a lot of time and effort trying to ensure that Windows 7 had a higher level of security. 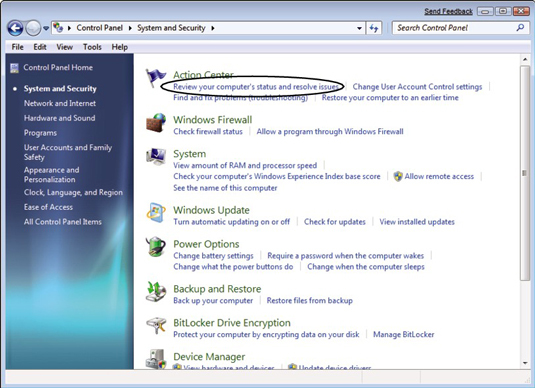 The best way to check your computer’s security status in Windows 7 is through the Control Panels’ System and Security window. Here, Microsoft provides security features that should help to keep your information private, whether at work or at home. From the System and Security window, you can check the status of the following security issues. Action Center: Microsoft provides one-stop shopping on all your security alerts. You can view any problems and link to the resolutions here. Windows Firewall: You can activate the firewall and create exceptions for your programs. Windows Update: Check for the latest security patches that need to be installed. Backup and Restore: Use the tools here to protect your files before there’s an emergency. BitLocker Drive Encryption: You can encrypt your data to keep it hidden from most eyes. Whenever you want to check your security status, the best place to start is the Action Center. Choose Start→Control Panel→System and Security. In the resulting System and Security window, click the Review Your Computer’s Status and Resolve Issues link. Check to see if there are any alerts tagged with red. Resolve these items first. These are the most serious security lapses that can put your data and personal information at risk. Check the Security item to see whether Windows found any antivirus software on your computer. 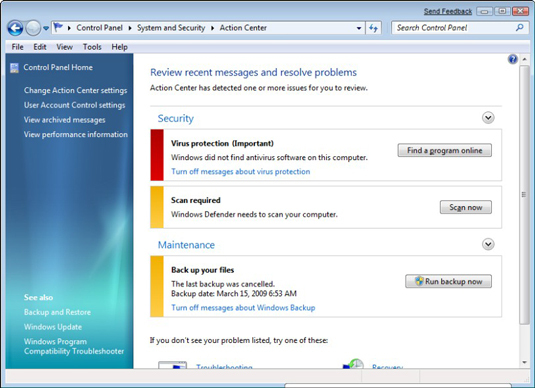 Antivirus programs protect you from malware that could cause advertising pop-ups, slow your computer’s performance, damage computer files, track your keystrokes while you type to steal your identity, and more. It’s very important that you have antivirus and antispyware software installed on your computer, and that you update them regularly. If you don’t want to pay for such a program, there are many good free programs. If Windows didn’t find any security software, click the Find a Program Online button and review Microsoft’s recommended security software partners. To purchase one of these solutions, click the logo of the company and then you’re taken to their site.